These essays by eminent European intellectual and cultural historian Anson Rabinbach address the writings of key figures in twentieth-century German philosophy. 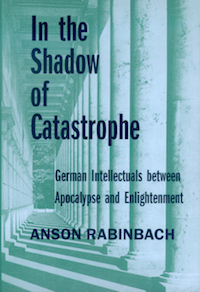 Rabinbach explores their ideas in relation to the two world wars and the horrors facing Europe at that time. Analyzing the work of Benjamin and Bloch, he suggests their indebtedness to the traditions of Jewish messianism. In a discussion of Hugo Ball's little-known Critique of the German Intelligentsia, Rabinbach reveals the curious intellectual career of the Dadaist and antiwar activist turned-nationalist and anti-Semite. His examination of Heidegger's "Letter on Humanism" and Jaspers's The Question of German Guilt illuminates the complex and often obscure political referents of these texts. Turning to Horkheimer and Adorno's Dialectic of Enlightenment, Rabinbach offers an arresting new interpretation of this central text of the critical theory of the Frankfurt School. Subtly and persuasively argued, his book will become an indispensable reference point for all concerned with twentieth-century German history and thought.